As Diamond Platnumz fans were still getting to terms with the interview he made regarding his baby mamas, Zari and Hamisa Mobetto, in which he revealed what went down between them, it turned out that the only thing he was worried about was the fact that he did not use protection resulting in a child. Fans have since been concerned that the Bongo flava star as opposed to telling his buddies to be faithful and stick to one partner, he was instead encouraging them to just do it provided they were using protection. "God will open a door for you that you didn't even knock on, stay faithful," Hamisa, who has been appointed as the Tanzanian Communication Regulatory Authority (TCRA) brand ambassador noted. Now this is the message that Diamond could have been telling his friends as he referred to them in his interview, but instead, it is Hamisa doing so, could she be doing part of the work that is required of her as a ‘Be Smart’ campaign Ambassador?, May be yes, and it comes as a hard paper now that she is opposing her baby daddy. TCRA has appointed Hamisa Mobetto as "Be Smart" ambassador, a campaign that encourages young people to post content that inspires others, that is exactly what Hamisa just did as opposed to the message by baby daddy that encourages others to go on rampage. Hamisa was appointed alongside three others that include; two musicians Barnaba Classic and Shilole plus comedian Dullvani. 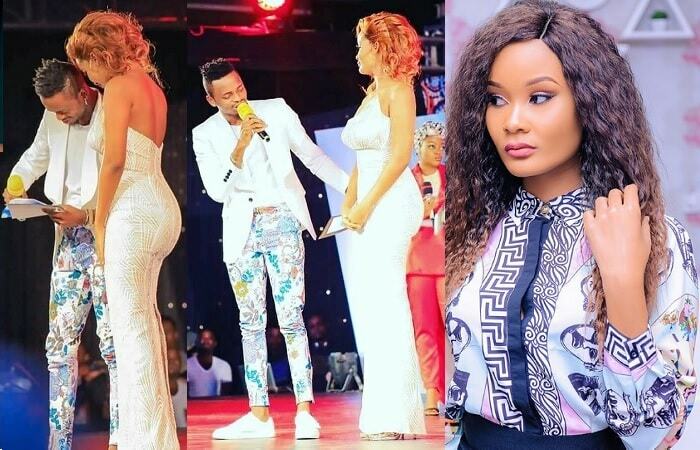 Meanwhile, before the Diamond side chic interview, Hamisa had revealed that she is willing to settle down with the singer provided he will accept to take care of her first born daughter, something that could be causing the recent cracks if the interview is anything to go by. It was assumed that all was well between these two after Zari made it clear that they (her and Diamond) were not about to reunite as lovers, leaving Hamisa feeling really hopeful, but after this interview, it turned out to be a false sense of hope. All is not lost though. In June, Diamond bought Hamisa a mansion where she is staying with her children and mother.